Vintage concrete stag sculpture, a stately depiction of a noble stag at rest, hand-modeled by an anonymous master artist in France using concrete during the early 20th century. Sculpture of hawk perched upon tree, masterfully executed in concrete. Large scale and impressive, this evocative sculpture is suitable for display in both indoor and outdoor settings. 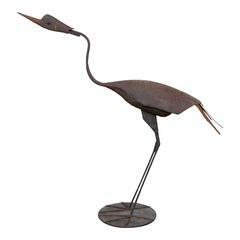 Steel heron sculpture, circa 1960-1980. A vintage American Folk Art piece. Painted Swedish candlesticks (circa 1840-1860). 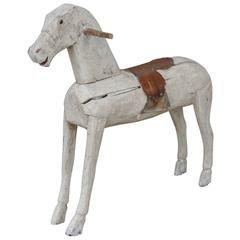 19th century carved and painted Folk Art toy horse with leather saddle from Sweden. French 20th century painted Folk Art sculpture boy in heavy cement. Plaster sculpture of sheep, circa 1950 Painted, playful sheep, cast in plaster. Measures: 14" W x 22" D x 18.25" H.
Plaster sculpture of sheep, circa 1950. Painted, playful sheep, cast in plaster. Measures: 13.75" W x 23.5" D x 18.75" H.
Plaster sculpture of sheep, circa 1950 Painted, playful sheep, cast in plaster. Measures: 13.5" W x 23" D x 17.75" H.
Butchers stone cow, circa 1950 Folk Art cow made from cast concrete with original paint. Charming, small hand-painted concrete toadstool garden sculpture.